<<-- Use the clickable map or the list to navigate. 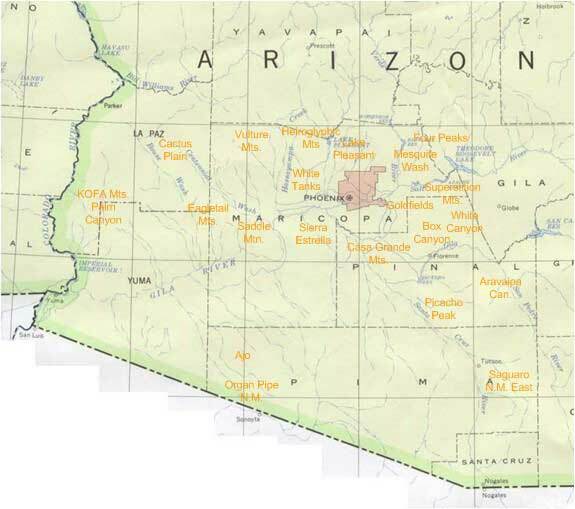 Sonoran Desert place names in bold have more extensive descriptions. Scroll down this page for places in the greater Phoenix, Arizona area. There are so many beautiful and fascinating places to visit in the Sonoran Desert that it is only possible to point the visitor to some of them. Like most I must work in a big city and find that I cannot get far from it on short weekends. Thus a disproportionate number of nature trail recommendations lie close to Phoenix, Arizona.